Manufacturer & Exporter of Burma Teak Wood for Door. 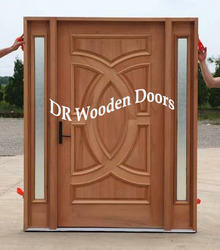 Our product range also comprises of Wooden Doors, Designer Wooden Door and Sliding Wooden Doors. With firm commitment to quality, we are manufacturing, supplying and wholesaling a comprehensive range of Burma Teak Wood for Door. This wood texture is hard and ring porous as it is manufactured from teak that is a large deciduous tree. Apart from making doors, it is widely used for cutting boards, indoor flooring, countertops and as a veneer for indoor furnishings. We hold expertise in manufacturing, supplying and wholesaling superior quality Burma Teak Wood Doors. These designer doors are manufactured keeping in mind the variegated requirements of our respectable customers using superior quality wood. The offered range of doors is high in demand amongst clients due to its impeccable finishing, durability and elegance. Looking for Burma Teak Wood for Door ?